An 80-year-old woman visited our hospital with a 1-year history of slowly progressive gait disturbance. There was no family history of cerebellar ataxia, although her sister was diagnosed with amyotrophic lateral sclerosis (ALS) at 68 years of age and died of respiratory failure at 72 years (figure, A). Our patient had no history of excessive alcohol drinking. Neurologic examination findings showed normal eye movement, mild dysarthria, hyporeflexia of the bilateral patellar and Achilles tendons, ataxia of the lower extremities, unstable standing without aid, and a wide-based ataxic gait. A cognitive examination was normal, with a Mini-Mental State Examination score of 30/30. Blood test results, including thyroid function, albumin, lipids, vitamin E, tumor markers, and CSF analysis were normal. Cranial MRI revealed bilateral cerebellar atrophy, while N-isopropyl-p-(iodine-123)-iodoamphetamine SPECT showed hypoperfusion of the brainstem and bilateral cerebellar hemispheres (figure, B). Nerve conduction study and electromyogram findings were normal. After obtaining informed consent, genomic DNA was extracted from leukocytes. First, we amplified the region containing the trinucleotide repeats in ATXN2 using the primer pair SCA2-A (5′-GGGCCCCTCACCATGTCG-3′) and SCA2-B (5′-CGGGCTTGCGGACATTGG-3′) and found a single amplicon slightly larger than a normal 22 trinucleotide repeat length (figure, C). Other genes for SCAs, including SCA1, 3, and 6, and DRPLA were normal (data not shown). Next, Sanger sequencing for the ATXN2 repeat region was performed, which demonstrated homozygous (CAG)13CAA(CAG)8CAA(CAG)8, a total of 31 trinucleotide repeats, and a chromatogram without overlap by another repeat length (figure, D). 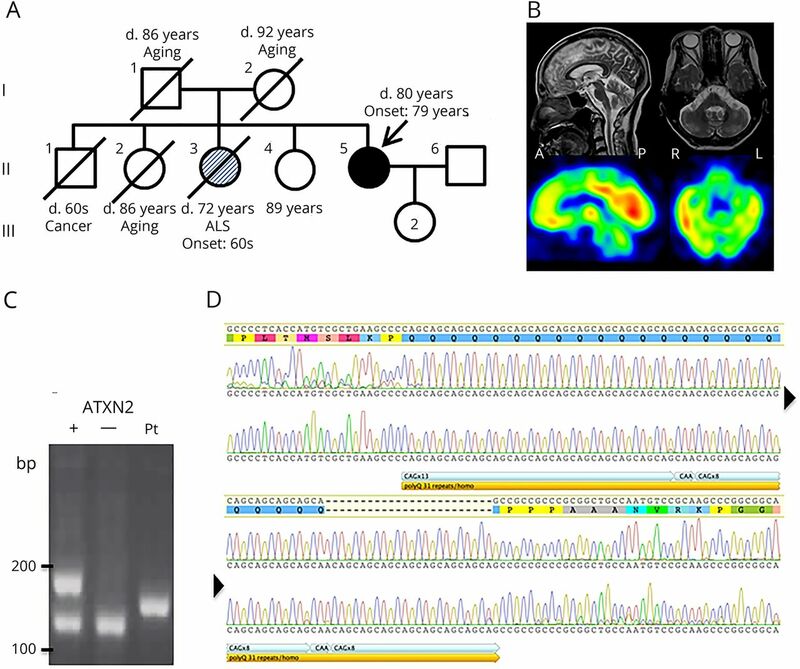 Finally, we applied whole exome sequencing to exclude other genetic causes of ataxia (table e-1, links.lww.com/NXG/A111) and found no causative mutation among the candidate genes except the homozygous expansion of trinucleotide repeats in ATXN2 (e-methods, links.lww.com/NXG/A114 and table e-2, links.lww.com/NXG/A112). Polyglutamine (polyQ) diseases are neurodegenerative disorders caused by the expansion of a trinucleotide (CAG) repeat, which is translated into an abnormally elongated glutamine (Q) tract in the respective mutant proteins. There are 9 known polyQ diseases, including 6 different spinocerebellar ataxias (SCA1, 2, 3, 6, 7, 17), dentatorubral-pallidoluysian atrophy, Huntington's disease, and spinal and bulbar muscular atrophy. All except for SBMA are inherited in an autosomal dominant manner, and each has its own normal, intermediate, and expanded trinucleotide repeat sizes. While there are several reports of cases homozygous for expanded trinucleotide repeat size, cases homozygous for intermediate trinucleotide repeat size are rare.5 Furthermore, there is no report of a homozygous normal trinucleotide repeat as causative of disease. As for the trinucleotide repeat length in ATXN2, 33 repeats are pathogenic (i.e., fully penetrant) and 32 in a homozygous state have been associated with very late-onset cerebellar ataxia, although clinical information has not been published.6 Cerebellar ataxia is never caused by 31 repeats in a heterozygous state. Therefore, the present case is important because it shows that a 31 trinucleotide repeat length in ATXN2 in a homozygous state is pathogenic. A pathogenic effect of a homozygous intermediate trinucleotide repeat in SCA6, another polyQ disease, has been demonstrated.5 Taken together, in polyQ disease, an intermediate trinucleotide repeat length in a homozygous state has the potential to cause disease because of a gene dosage effect, although the repeat is not necessarily pathogenic in a heterozygous state. One available mechanism-based treatment for patients with polyQ disease is reducing the levels of toxic disease-gene products by antisense oligonucleotides, short hairpin RNAs, or miRNAs.7 The present case suggests that in polyQ diseases with an intermediate to hopefully mildly expanded trinucleotide repeat length, the reduction of polyQ proteins by ∼50% should substantially mitigate the effects of the disease. M. Tojima: study concept and design, acquisition, analysis and interpretation of data, and drafting the manuscript. G. Murakami: study concept and design. R. Hikawa: acquisition and analysis of data. H. Yamakado: study concept and design, analysis and interpretation of data. H. Yamashita: study concept and design, analysis and interpretation of data, study supervision, and critical revision of manuscript for intellectual content. R. Takahashi: study supervision and critical revision of manuscript for intellectual content. M. Matsui: study concept and design, study supervision, and critical revision of manuscript for intellectual content. The authors report no disclosures relevant to the manuscript. Full disclosure form information provided by the authors is available with the full text of this article at Neurology.org/NG.
. The role of the SCA2 trinucleotide repeat expansion in 89 autosomal dominant cerebellar ataxia families. Frequency, clinical and genetic correlates. Brain 1998;121:459–467.
. Chromosomal assignment of the second locus for autosomal dominant cerebellar ataxia (SCA2) to chromosome 12q23-24.1. Nat Genet 1993;4:295–299.
. Molecular and clinical correlations in spinocerebellar ataxia 2: a study of 32 families. Hum Mol Genet 1997;6:709–715.
. Consensus and controversies in best practices for molecular genetic testing of spinocerebellar ataxias. Eur J Hum Genet 2010;18:1188–1195.
. Pathogenic effect of an intermediate-size SCA-6 allele (CAG)(19) in a homozygous patient. Neurology 2001;57:1502–1504.
. Amyotrophic lateral sclerosis risk for spinocerebellar ataxia type 2 ATXN2 CAG repeat alleles: a meta-analysis. JAMA Neurol 2014;71:1529–1534.
. Gene suppression strategies for dominantly inherited neurodegenerative diseases: lessons from Huntington's disease and spinocerebellar ataxia. Hum Mol Genet 2016;25:R53–R64.